My Lai Pilot Hugh Thompson Hugh Thompson Jr., a former U.S. Army helicopter pilot honored for rescuing Vietnamese civilians from his fellow GIs during the My Lai massacre, has died at age 62. 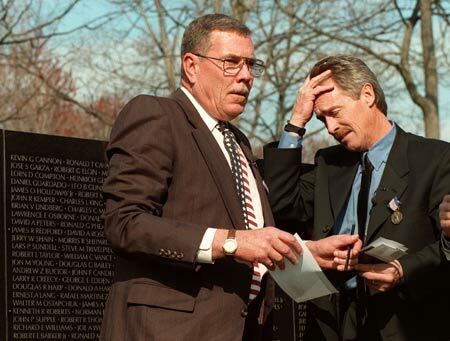 Former U.S. Army pilot Hugh Thompson, Jr., left, and former gunner Lawrence Colburn react after making a rubbing of fallen comrade Glenn Andreotta's name from the Vietnam Veterans Memorial in Washington, D.C., March 6, 1998. Hugh Thompson Jr., a former U.S. Army helicopter pilot honored for rescuing Vietnamese civilians from his fellow GIs during the My Lai massacre, has died at age 62. Early in the morning of March 16, 1968, Thompson, door-gunner Lawrence Colburn and crew chief Glenn Andreotta came upon U.S. ground troops killing Vietnamese civilians in and around the village of My Lai. They landed the helicopter in the line of fire between American troops and fleeing Vietnamese civilians and pointed their own guns at the U.S. soldiers to prevent more killings. Colburn and Andreotta had provided cover for Thompson as he went forward to confront the leader of the U.S. forces. Thompson later coaxed civilians out of a bunker so they could be evacuated, and then landed his helicopter again to pick up a wounded child they transported to a hospital. Their efforts led to the cease-fire order at My Lai. In 1998, the Army honored the three men with the prestigious Soldier's Medal, the highest award for bravery not involving conflict with an enemy. It was a posthumous award for Andreotta, who had been killed in battle three weeks after My Lai. "It was the ability to do the right thing even at the risk of their personal safety that guided these soldiers to do what they did," Army Maj. Gen. Michael Ackerman said at the 1998 ceremony. The three "set the standard for all soldiers to follow." Lt. William L. Calley, a platoon leader, was convicted and sentenced to life imprisonment for his role in the killings, but served just three years under house arrest when then-President Nixon reduced his sentence.